An experience that has proven to be an effective intervention for first year students is the first year seminar. Research supports that students' participation in first year seminars is effective in retention, persistence toward graduation, higher grade point averages, and social integration. Results from the 2001-2002 First Year Initiative Survey provides support that there is a positive relationship between the instructional techniques used in the first year seminar and acquisition of academic and critical thinking skills for students enrolled in the three-contact hour first year seminar. A correlational analysis was performed on the 2001-2002 First Year Initiative Survey results, which identified four institutions of higher education. 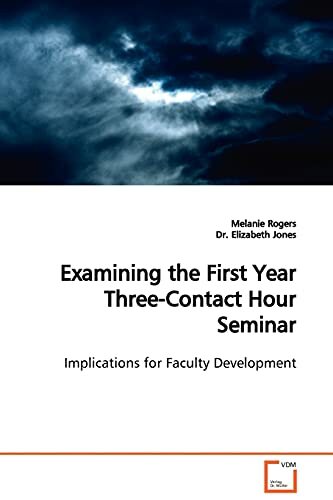 A multiple case study approach was employed to provide a rich description and analysis of the first year seminar faculty development phenomenon. Dr. Melanie B. Rogers received her Master of Arts degree in Counseling and her Doctorate of Education from West Virginia University. She is currently a psychotherapist in private practice. Her research focus is in assessment in higher education, retention, student development, and student learning.